A couple of weeks ago, I posted a blog on the benefits of NetApp clustered Ontap with virtual desktop. 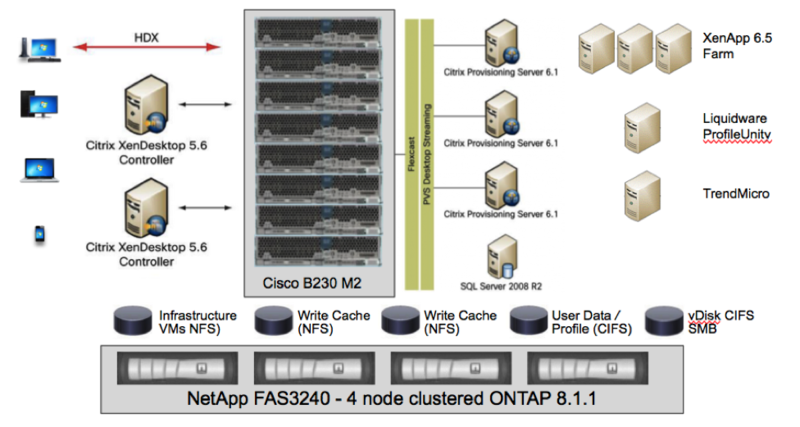 I have been working on a reference architecture of XenDesktop on NetApp clustered OnTap last 3 months. There will be a design technical document published in February. Citrix Provisioning Services streams multiple desktops to the hypervisor VMWare ESXi 5.0, and Citrix XenDesktop manages desktops and facilitates the connections between endpoint devices and desktops.XenApp is used as an application delivery solution to enables any Windows® application to be virtualized, centralized and managed. Also hosted share desktops are delivered by XenApp. Liquidware Lab ProfileUnity manages user profile and folder redirection. A four nodes NetApp clustered OnTap is used as storage to host write cache on NFS shares, vDisk on CIFS SMB 2.1 and user data and profile on CIFS SMB 2.1 as well. Cisco switches and fabric interconnects, and an integrated set of storage and software components. FAS3270 4 node cluster running 8.1.1 Clustered Ontap, each node has 2 shevles of DS2246 configured with 450 GB, 10,000 RPM SAS drives and 256 GB of intelligent flash memory cache. We created one large aggregate on each nodes in the NetApp cluster. The following diagrams show the different volumes we created for this solution. For good housekeeping purposes it is best practice to create a new LIF when a new volume is created. A key feature in Clustered ONTAP is the ability to move volumes in the same Vserver from one node to another. When the volume is moved, move the associated LIF as well. This will help keep the virtual cabling neat and will avoid indirect I/O, which will occur if the migrated volume does not have an associated LIF to use. It is also best practice to use the same port on each physical node for the same purpose. Due to the increased functionality in Clustered ONTAP more physical cables are necessary and can quickly become an administrative headache if care is not taken when labeling and placing cables. By using the same port on each cluster for the same purpose, you will always know what each port does. Next blog I will discuss clustered OnTap network design and best practice. This entry was posted in virtual desktop and tagged best practice, Citrix, cluster, design, ontap, software, storage, VDI, volume, xendesktop. Bookmark the permalink.